Conrad Mecheski started 'One liners' some 25 years ago. Conrad explains: "A one liner is putting the pen onto a surface and not picking it up until the expression is complete". He says: "Over the years they developed as a direct approach to a figurative idea or memory. Many have been used as part of a larger painting via collage. These pieces are from the last couple of years. A diary of my life. They are fresh and minimalist, capturing the essence without a second thought to wipe away doubts that hide inner truth or direction". 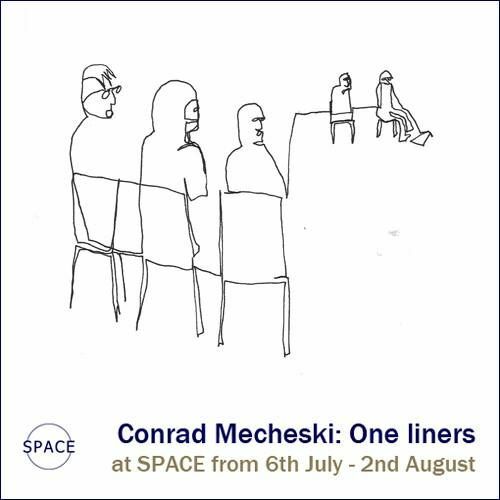 269 of Conrad's one liners will be displayed together for the first time at SPACE gallery from 6th July (running until 2nd August). Also featuring outdoor installation (weather permitting) by Julia Maddison, film from Jordan Mouzouris and photography from Jevgenija Bitter. Private view: Saturday 6 July 7-9PM (entry is free and no ticket is required). Please bring a bottle. All liquid donations will be shared equally amongst guests.